Berkshire Hathaway (NYSE: BRK.B) shares rallied 3% this week on news that Warren Buffett's company bought roughly $1 billion of its own stock in August. Analysts are speculating that Berkshire bought its own stock after the recent volatility in the markets in October, where shares of BRK.B dropped 4.9% for the month. Warren Buffett didn't make a fortune buying high and selling low. He made money by waiting for the market to come to him and then pouncing. Today, we're going to show you exactly how he does it. And how easy it is to make gobs of cash in the process. 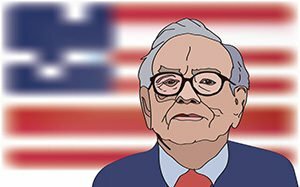 The first thing that you need to know is Warren Buffett doesn't think in terms of buying and selling ticker symbols. He believes that when you buy shares of a company, you are an owner of the company. You wouldn't buy a local business in your town without doing exhaustive research first. You'd want to know everything about the company's operations, its management, its products, its finances. Everything. That's how Buffett approaches buying stocks. And his investments focus on companies that generate tons of cash. That cash is what Berkshire turns around and uses to buy back its stock or big chunks of other companies. It has big stakes in companies that have strong cash flow, including: American Airlines Group Inc. (NASDAQ: AAL), American Express Co. (NYSE: AXP), Apple Inc. (NASDAQ: AAPL), Bank of America Corp. (NYSE: BAC), Kraft Heinz Co. (NYSE: KHC), Phillips 66 (NYSE: PSX), and Wells Fargo & Co. (NYSE: WFC). In October, Buffett put a total of $600 million to work in two fintech companies: Brazilian credit card processor StoneCo Ltd. (NASDAQ: STNE) and the parent company of India's largest mobile-payments service, Paytm. The investments are an important reminder for us too. Markets might be sitting near record highs, but Buffett's firm is still finding opportunities. Waiting for the market to present buying opportunities can be difficult. But they emerge every single day. You just have to know where to look and how to find them. Luckily, you don't have to search too hard. Money Morning Special Situations Strategist Tim Melvin has been finding uncommon opportunities in corners of the market that you probably didn't know existed.